2014 - World Series X, "A Decade of Excellence"
DEA Combo wins World Championship! Cali-Force claims Gold Division Title! 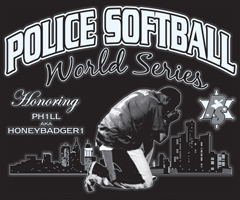 2014 marked the 10 year anniversary of the Police Softball World Series. To commemorate the event specially designed logos were unveiled with the Roman numeral X (ten). Even the stone obelisk trophies were special as they were made of a pearl white marble which is a stark contrast to the previous 9 that were made from black and green stone. The event was simply called World Series X. Those who have been along for the ride since the first World Series has seen it grow from 32 teams in Palm Springs to a record 70 teams in Las Vegas. For the first year ever, the Open Division (Majors/Gold) completely sold out at 60 teams. Majors featured the 24 best teams in the nation whereas the Gold Division was larger, boasting 36 teams. 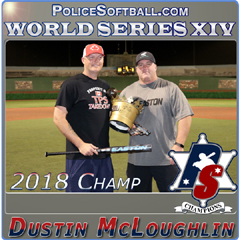 It was once again a bat-provided event courtesy of Brett Helmer & Easton Sports, Denny Crine & Miken, and police softball Hall of Famer Terry Dugan who provided Demarini bats courtesy of his Lockdown Sports business. Early arriving guests were treated to a player reception/party at the Hideout Pool at the Golden Nugget. Beverages were courtesy of the event sponsors Terry Dugan (Lockdown Sports), Kevin Schoch (Garrett Metal Detectors), Stacy Yudin (N.E.P. 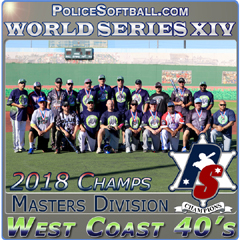 websites) and Policesoftball.com. The opening ceremony was the most well attended to date as the Big League Dreams facility reported a gate tally of over 1200. The Las Vegas Metro Honor Guard presented colors and Metro Detroit’s Finest veteran Chris Killop’s special guest Gabrielle Kitto (age 13) sang the National Anthem. Ohio Lawmen legend Craig Singleton blessed the event with a heartfelt invocation. Chris Enriquez of the HardCor team threw out the first pitch in honor of his teammate Ryan Saucedo who is battling cancer. All cancer survivors in attendance were invited to come on the field as a sign of unity for Ryan and those in the police softball circuit who are either battling cancer, or who have battled and won! The Home Run derby came down to two relatively unknown players to the circuit. Team Louisiana slugger Dustin Lavergne emerged from the pack to represent the East Conference while Nitro2Go rookie Luis Velasquez came out on top to represent the West Conference. In their head to head matchup Velasquez’ power was too much for Lavergne to overcome and Velasquez was declared KING. Later King Velasquez and Lavergne teamed up in a Pros vs. Joes contest against Denny Crine (Miken) and Bryson Baker (Easton). The Pros put on a firework display which only solidified why they get paid to play and the Joes are cops. Our season award winners were presented plaques courtesy of the Sacramento County Sheriff’s Association. The All-Decade team was recognized along with individual team MVPs. The Police Softball Hall of Fame welcomed new members: Ken Dawley- DEA Combo, Jimmy Sanders- HardCor, Mark Tolliver- HardCor, Jaime Caterino – Steel City Lawmen, Jimmy Cavuto – New York Metro, Tim Conroy – Suffolk County NY – NY Metro, Butch Crozier – NYPD Blues, Paul Cullen – Jacksonville Police Softball Club – 3N2/D2E, Scott “Sami” Samis – Shamrock Lawmen New Jersey. There was a twist to the round robin this year as Majors/Gold teams were mix/matched and the Majors teams had to face a 7 run handicap. As predicted it kept games much closer and there were even some upsets. Gold teams Wayne Oakland and SoCal Riot defeated Majors teams Battle Born and Minnesota Lawmen (in respective order). 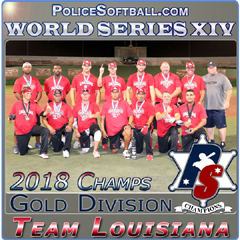 One of the most intense round robin games featured the Gold Division rising stars Team Louisiana pushing former Majors World Champions to the limit. It took some walk off magic for HardCor to finally secure a one run victory over the fiery Louisiana squad. Under the new format there would be no “gimme games” in the Majors Division. From game 1 every team would be facing a heavyweight contender with a similar talent level to their own team. In round 1 HardCor couldn’t get the offense going against the cagey pitching of the Maryland Young Gunz veteran Ron Breeden, but they did hold on long enough to post a 17-14 victory to force the Young Gunz into the losers bracket early. Another former World Champion the Ohio Lawmen (World Series I) sent the Iowa Lawmen down to visit the Young Gunz. The Iowa Lawmen finished 3rd in the Gold Division last year so they are to be commended for playing up with the Majors this year. The Shamrock Enforcers were having their best year to date and they continued to add to it with a convincing victory over the NorCal based Stanislaus team. North Florida bested the Border Patrol Arsenal in a close game while the local Vegas based Battle Born overcame a very talented Team Texas. OH5O handled the Central California Connection who were making their World Series debut and promptly earned a berth into the Majors Division. The team that had many people talking early, San Antonio Law gave the favored Minnesota Lawmen everything they could handle but Minnesota eventually prevailed 20-16. California Showtime plated 28 runs against 20 runs for their NorCal counterparts West Coast United. Round 2 introduced some big guns into the mix who had earlier earned byes due to their performance in the round robin. 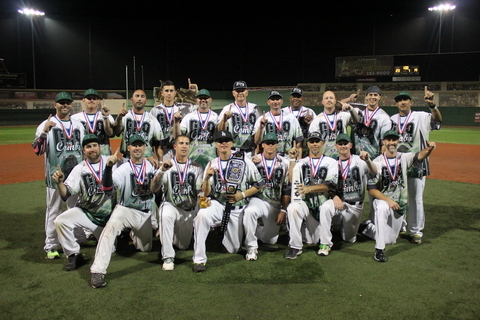 The biggest surprise of the tournament the Mid-Atlantic Demarini Lawmen inked a big upset over a flat HardCor team 15-3. The most anticipated round 2 game was between the loaded Los Angeles based DEA Combo and the Ohio Lawmen who had brought their best team in years. The teams did not disappoint but in the end the DEA prevailed 31-21. SoCal Lockdown was also having their best year to date so their win over the equally hot Shamrock Enforcers was not necessarily an upset, but those who had followed Lockdown throughout the year knew they had the ability to take down the favored Shamrocks. The Missouri Lawmen played clutch softball and they squeaked by North Florida Showdown 26-25. In yet another nail biter the Great Lakes Lawmen bested Battle Born 21-19. The top team in the nation heading into the event was the NYPD Blues. They had won four consecutive tournaments and were riding a 25+ game win streak. They crushed their opponents in the round robin and they carried that momentum into their matchup against OH5O which they won convincingly. The Minnesota Lawmen send the defending two-time back-to-back World Champions SoCal Alliance into the loser bracket early. The team many had picked to win it all, 3N2/D2E Lawmen didn’t quite look like they were firing on all cylinders, but they had enough in the tank to defeat California Showtime. In round 3 Mid-Atlantic/Demarini received a wake-up call at the hands of the DEA Combo. It was one of the more “spirited” games and the feisty Mid-Atlantic squad kept chipping away all game to keep it close, but the DEA Combo managed to hold them off. The Missouri Lawmen were considered a dark horse to get deep into the tournament, but their victory over SoCal Lockdown had people all over the park talking about how strong they looked. The NYPD Blues continued their winning ways sending the Great Lakes Lawmen (2011 World Champions) into the losers bracket. In yet another “upset” the Minnesota Lawmen offed 3N2/D2E Lawmen. In the majors no team had started slower than Minnesota and as fate would have it nobody had gotten hotter at the right time. 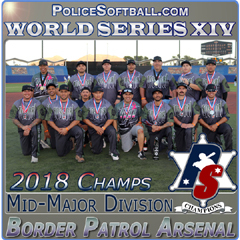 The final 4 in the Majors featured DEA Combo defeating the Missouri Lawmen and the NYPD Blues narrowly getting by Minnesota. The stage was set in another classic East vs. West match up and it was no surprise the teams involved were DEA Combo and the NYPD Blues. Many had projected these very two teams to be in the big dance so their collision course seemed inevitable. The stands were packed, emotion was high, and the talent level displayed by both teams was beyond impressive. In the undefeated game, DEA Combo seemed destined as they handed the NYPD Blues their first loss since March! If any team could come back to double dip the Combo, the NYPD Blues had the ability to do just that, but they had to earn a shot at it. In the losers bracket the SoCal Alliance who had lost their first playoff game were no strangers in doing the death march through the losers bracket. In 2012 that is exactly what they did as they peeled off 9 straight wins and double dipped the undefeated team enroute to their 3rd World Title. The next year they took the easier path going undefeated to win their 4th. It looked like that might play out again this year as they posted victories over Stanislaus, California Showtime, Mid-Atlantic, Battle Born and gained revenge against Minnesota. Their luck ended with 5 straight wins when an inspired Great Lakes Lawmen eliminated the defending champs. Great Lakes could not maintain the hot hand as the NYPD Blues eliminated them the very next game. The stage was set for a rematch between the undefeated DEA Combo and the highly motivated NYPD Blues. It was getting late into the night and the ball park was filled with fans who were hoping for an exciting game. Both teams played inspired softball, but on this date the DEA Combo could not be denied. The DEA Combo, led by Hall of Fame Coaches Jim Gomez and Larry Jones were declared World Champions for the first time ever and the team celebrated with champagne showers and powerful man hugs. Those in attendance including ps.com staff sensed early on that their time was now and they were going to seize the moment, just as they did. The NYPD Blues coach and Hall of Famer Rick Tirelli gave a well worded speech to his disappointed players, but the fact was the Blues had no reason to hang their heads. They just recorded the most successful year in team history and collected 4 tournament championships along the way. DEA Combo won 6 brand new Easton bats & $700 worth of merchandise from Elite along with the Obelisk and champion medals. NYPD Blues won Easton roller bags and $300 worth of Merchandise from Elite. The Great Lakes Lawmen won Easton back packs. We want to first address the elephant in the room. That elephant is the talent level of the Gold Division. The Gold Division today is what the Majors Division was just a few short years ago. There were some truly talented teams in the Gold Division and many would have had a chance to win Majors in past years. The Gold Division was once considered the “lower” division but after watching the games, the line between Gold and Majors is very blurred. Not only is the Gold Division very talented it is also the larger division as it swelled to 36 teams this year! Winning the Gold Division this year would be a tall order due to the sheer number of wins a team would need to record in order to claim the title. 8 lower seeded teams (29-36) did not earn a bye so they had to win a game to get to the first round. Those games were as follows: Mid West Heat over Oakland PD, Guard Dogs defeated Thin Blue Line, Team Vargas bested Detroit PD, and the Central Coast Heroes over the Chino Knuckle Draggers. Round 1 would either make or break teams. Going into the loser bracket at this stage would mean a team would need to win a whopping 11 straight games to claim the championship. The odds on ANY team doing that are slim to none. So here is how it played out: Cali-Force defeated fellow NorCal ballers the El Dorado Cartel. The loaded Florida Enforcers handled the Texas Cartel. The Canadian Regina Cyclones were the round robin surprise going 2-0 but they were quickly dispatched by the Mid West Heat. Miami Metro Dawgz defeated the NorCal Shockers and Louisville Metro put the wood to the SoCal based San Bernardino Hit Squad. SoCal Riot stayed red hot by smashing the Guard Dogs and Nitro2Go beat Dayton Metro in a high scoring affair. Toronto Takedown stood victorious over the Seattle based North West Shakedown. Charles County looked strong in round robin but they were overtaken by the Kansas City Guns who coincidentally did not look nearly as sharp in round robin. 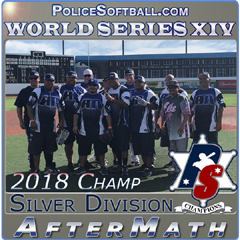 The defending Gold Division World Champions Chicago Metro looked very rusty in round robin (0-2) so when they dropped 49 runs on the Port Authority Twins/PAPD Twins, it looked as if they finally regained their mojo. Metro Detroit looked dialed in with a win over Team Vargas. In a very tight game the Steel City Enforcers snuck away with a 20-19 victory over the Maryland Outlaws. In another close one the favored LA Lawmen pulled a rabbit out of the hat to defeat Arizona Ablaze 19-18. The Michigan based Wayne-Oakland squad was making their first appearance at the World Series in over 5 years but they looked as sharp as ever with an impressive win over the Central Coast Heroes. NorCal Elite defeated the Kansas City Pigsters in a low scoring game and finally Team Louisiana sent the DMV Lawmen (formerly known as the DC Enforcers) into the loser bracket. The next round saw Cali-Force defeat the Florida Enforcers (first appearance as a team), Miami Metro Dawgz 15-13 over Mid West Heat, the sizzling SoCal Riot 16-15 over Louisville Metro, Nitro2Go put the boots to Toronto Takedown, The Kansas City Guns sent the defending champs Chicago Metro into the loser bracket 18-17, Steel City caught a very flat Metro Detroit’s Finest and inked a 17-2 win, in yet another one run game, Wayne-Oakland 13 LA Lawmen 12 and finally Team Louisiana easily handled NorCal Elite. As the day progressed on Friday so did Cali-Force. They completed their perfect day with a win over the surprising Miami Metro Dawgz. SoCal Riot’s hot streak ended at the hands of Nitro2Go. The Steel City Enforcers cooled down the Kansas City Guns and finally, Team Louisiana bested Wayne-Oakland. On Saturday morning the Elite 4 squared off as Cali-Force sent their cross state rivals Nitro2Go into the losers bracket and Steel City derailed Team Louisiana. The undefeated game between Cali-Force and Steel City was held at 6pm on Saturday night and the stands were packed as they took center stage on Angel Field. In a close game, Cali-Force emerged victorious and earned their ticket to the big show. They were in the driver seat and would need to be double dipped by whoever came out of the loser bracket. In this case, just as it was in Majors, the team that lost the undefeated game battled back to earn a shot at the title. Steel City defeated Miami Metro Dawgz and in doing so they set the stage for a rematch against Cali-Force. Early on, and throughout the game Steel City seemed to be in control. Tournament Director Jeff Blair asked Cali-Force manager Eddie Russell if there would need to be an “IF” game and Eddie confidently responded, “No we got this.” It seemed like a tall order as they were chasing 8 in the 5th inning, but just as Eddie predicted, the did have it. 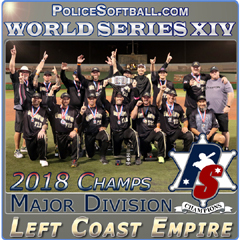 Cali-Force responded with a couple big innings en route to defeating the Steel City Enforcers and claiming the title of Gold Division World Series Champions! It was a great run for both teams as they both played with heart and determination. Cali-Force won 4 new Easton bats and $700 worth of merchandise from Elite along with the Obelisk and championship medals. Steel City Enforcers won Easton roller bags and $300 worth of merchandise from Elite. Miami Metro Dawgz won Easton back packs. The Silver Division was reserved for those 12 Gold teams who did not fare well come playoff time. It was a single elimination event that saw North West Shakedown steamroll through three California based teams: Central Coast Heroes, Team Vargas and Chino Knuckle Draggers en route to a perfect 3-0 championship run. They won a new Miken bat along with champion medals. With only 5 teams in Masters it is one of the few divisions that has seen a sharp decrease in participation since its inception when the event averaged 14 teams. Since that time the interest has steadily declined and the idea of putting the event on Sunday, after the open tournament was not successful. For those teams that did play, they got a lot of games in, in a short period of time and the players seemed to really enjoy the compressed format. The Garden State (Jersey based) team crushed everyone in round robin going 4-0. They beat the East Coast Lawmen in the semi-final playoffs and faced West Coast 40’s in the ship. They had defeated the 40’s earlier in the day and they stretched a full 7 innings out of this game. It took a walk off bomb by hulking Vegas slugger Rick Bass to secure the title for the West Coast 40’s. The 40’s won a prize package from 3N2 sports courtesy of Hall of Famer Dennis Leonard along with an Obelisk. This year only 4 teams participated, which puts the event in jeopardy for next year. That said, those 4 teams that played had a blast. The 2x defending champions SoGal’s Alliance went undefeated 3-0 through round robin and after defeating the San Bernardino Knockouts in the first playoff round they seemed destined for a three-peat. But, they caught the Sin City Betty’s at the wrong time and the Betty’s relentlessly pound the ball against the SoGal’s. When the dust settled the Betty’s had recorded a major upset and become the 2014 Women’s Division World Champions along the way! They won a prize package from 3N2 sports courtesy of Hall of Famer Dennis Leonard along with an Obelisk. Policesoftball.com (Del & Jeff) would like to thank several people for making this year’s event such a huge success: Brett Helmer (Easton Sports), Terry Dugan (Lockdown Sports/Demarini), Denny Crine (Miken) , Kevin Schoch (Garrett Metal Detectors), Sacramento County Deputy Sheriff Association, Ed Farmer & Chris Devlin (Big League Dreams), Tom Phundstein & Ernie Ono (USSSA-Las Vegas), Tracy Morgan (Golden Nugget), the Las Vegas Metro Police Honor Guard, Dennis Leonard (3N2), Carlos Vega (Elite), Gene & Luann (Softball Magazine), Mike O'Neil, and our wives Michele (Del) & Anne Marie (Jeff). Lastly thanks to all who attended for your continued support of www.policesoftball.com as without you there would be no World Series. We intend to make next year even better! So please ink the 2nd weekend in October for World Series XI (11) which is tentatively set for October 8-10 (Thu-Sat) 2015 in Las Vegas, Nv. at the Big League Dreams facility once again.